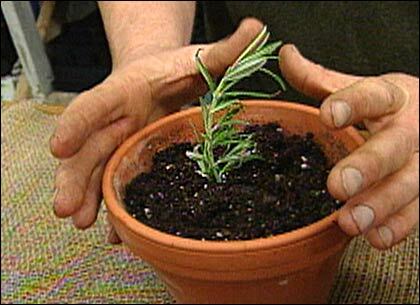 You can start a brand-new rosemary plant from a single stem cutting. Whether you're one year in or just getting started, Michael Weishan walks you through the steps of creating a rosemary topiary. When you're driven inside on a rainy day, but still want to garden, creating from scratch, or working on an existing topiary, is the perfect indoor project. A topiary is a tree or shrub that has been lovingly pruned into an ornamental shape, such as a ball, a square, and other geometric forms-sometimes taking several years to form depending on the how elaborate the design is. Rosemary, thyme, and yew are common plants used to create topiaries. Michael has grown this thriving rosemary over the past three years. 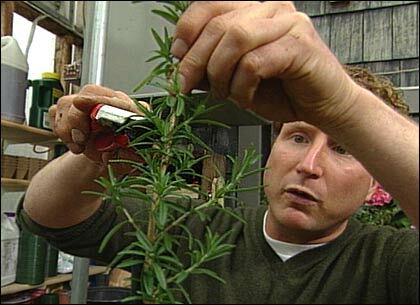 To get started, clip a sprig of rosemary off an existing plant and strip its leaves off the bottom. 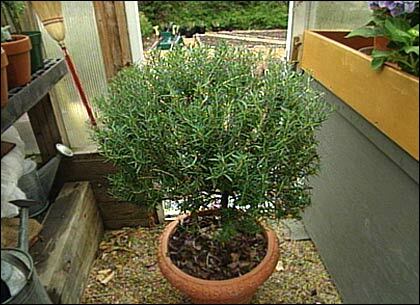 Dip the bare end of the rosemary sprig in some rooting hormone and plant in a well-drained potting soil mix. It's a good idea to create a tent from a piece of cellophane or plastic over the top of the plant to keep in the humidity. In a couple of months the sprig will root. As the plant grows, tie the stem to a stake to keep it straight. To start the topiary ball, remove the top of the plant between two new shoots. Once the plant has reached the desired height, about 2 1/2 feet for The Victory Garden's topiaries, decide where you want the ball to start and cut off the top of the plant between two new shoots. The plant will eventually grow into a ball from these two sprigs. Keeping the stem bare of leaves forces energy to the top of the plant, helping the ball take shape. The next step will feel radical: Remove every bit of growth — this means all leaves and sprigs — from the bottom of the stem up to 1 or 2 inches below where you made your first cut. This will force all the energy to go to the top of the plant where you want the ball to form. Remember to keep the stem of the plant stripped of any growth. As the plant grows and begins to form a ball, you can help the process along by pinching back the tips of the branches. This will force them to double out and form two new sprigs the way the original stem did. With a little effort and time — just 2 or 3 years — you'll have a topiary to rival Michael's.